(September 23, 2011) This week, netizens take on polluting phone manufacturers, document Beijing’s traffic troubles, successfully shut down a hunting festival and investigate sales of mysterious “gray swan” meat for the Mid-Autumn Day Festival. 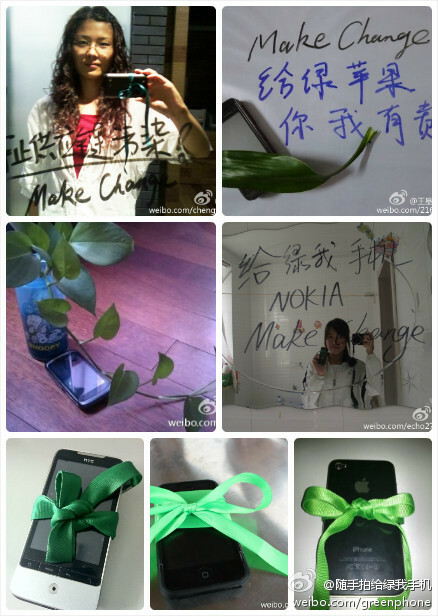 Netizens send a message to phone companies. 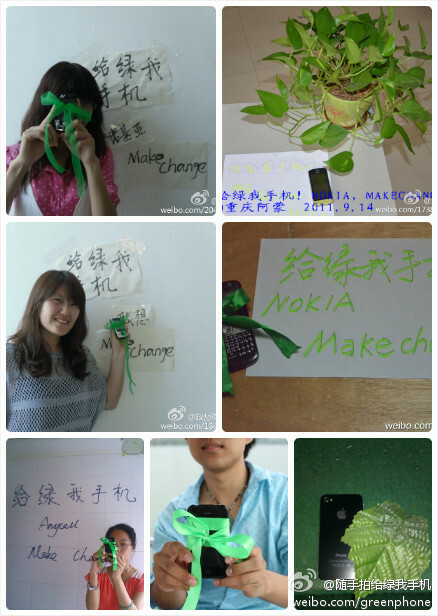 Internet users can participate in this campaign by taking a photo of their mobile phone with a green ribbon or plants, as well as with a message they want to tell the mobile phone company. All photos will be collected on this page on Douban. September 10: With Beijing’s traffic jams getting worse and worse, Friends of Nature director Li Bo @李波fon has set up a Weibo group called “Parking Welcomes You”– an ironic twist on the tourism slogan, “Peking Welcomes You” – to document and discuss Beijing’s serious traffic issues. Li Bo is encouraging netizens to photograph traffic jams to show the public’s stress and frustration with road congestion, and to remind citizens of the need to reform road transportation. Indeed, on September 9, China’s Black Friday before the Mid-Autumn Day long weekend, a front page article in The Beijing News warned that the traffic peak would last six hours. An undated announcement posted on China International Hunting Festival said that for many reasons, the hunting festival has been postponed or canceled. Internet users are monitoring the site to make sure that this activity will be postponed forever. The sale of swan meat was revealed online on September 7. Then, on September 16, the National Business Daily reported that the swan meat is made from so-called “gray swans,” a cross-breed of some, as yet unknown, species. In fact, many such “swans” are being bred in Jiangsu province. The issue received no follow up after that.